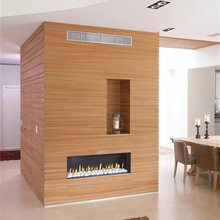 Gorgeous modern European fireplace installed smoothly, on time and on budget. Gerard was brilliant, only needed a brief visit to provide suggestions and estimate. He came up with the “birch storage” at the bottom and the result is stunning! They were truly a pleasure to work with. The project took place while I was constantly traveling overseas and everybody communicated perfectly via email and text. Corinne and Rosie in the administrative department kept me posted at all times via email. I highly recommend them and will hire them back in a heartbeat! Fireplace Element worked with us on two projects, a natural gas fireplace from their shop in our living room and a large custombuilt firepit on the patio, which came with the wrong jet system. From the estimates and selection, to the workers hooking up the natural gas lines in the house and to the firepit, putting in the insert and replacing the firepit jets with a spur, to arranging permits and inspection, everything was efficient and professional. When there were problems with the rate of BTUs which might have necessitated a new meter AND a replacement window, Corrine came up with a creative solution that added no expense and needed no meter or window replacement. 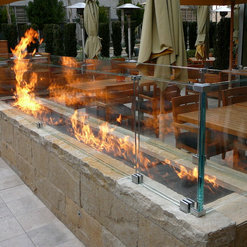 We are delighted with Fireplace Element and heartily recommend them. 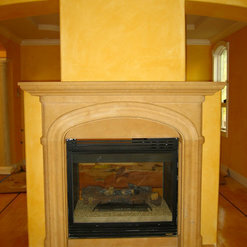 We have re-modelled several rooms in our house and The Fireplace Element built two beautiful fireplaces for us. 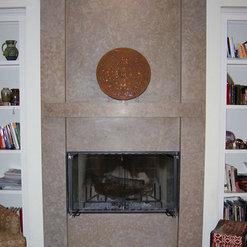 The first is a limestone fireplace with a marble hearth. 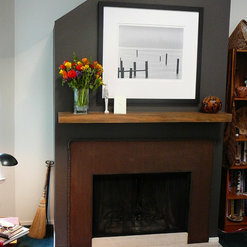 The second is a two color raised hearth fireplace, which looks awesome. Gerard also cut matching stone for a table top. Corrine and Gerard helped us to get to a design we liked and select the materials; Gerard is an excellent craftsman and brought the design to reality. The project was completed for the agreed price and the work was completed on-time. 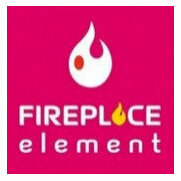 I would highly recommend The Fireplace Element, they did an excellent job for us. The Fireplace Element provided "one stop" shop/full service professional From the time I visited the showroom and met Amy and Corinne I knew I was in the right place. I viewed units and their portfolio. Corrine offered her design expertise and was very accommodating with regard to keeping within my budget and my design vision. However, I was very grateful for her suggestions. I preferred a one stop shop so I wouldn't have to have all different workers or a contractor. FE works with and employs excellent professionals. They knocked out an old brick fireplace. Then we had the fireplace insert installed and also had their drywall experts put in new drywall and they built a frame for the stone and fireplace. We had Corinne's tile/stone expert tile the fireplace. While she was happy for me to pick out any tile/stone I went with the original sample she had shown me at the store. 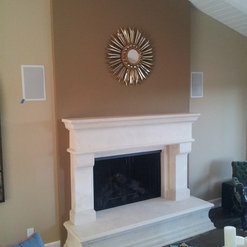 I chose a limestone which they fabricated and installed. The stone is beautiful and the design/pattern that Corinne planned was perfect. I have a one of a kind fireplace. Corinne also helped me with paint color ideas and was happy to come to the house for the original measure and design plan idea and later when I was having color issues. Although I decided to go with the limestone slab, Corinne was very receptive to my suggestions for tile and paint color. She was happy to make suggestions when I texted her photos of tile and paint color. She was also willing to go to a tile shop if necessary. We love our new room. It's more beautiful than I would have imagined. There were a few bumps along the way with regard to some miscommunication with regard to parts of the job/design and scheduling. There were times when they did not come when they said they would and did not contact us to let us know. Because of this the job did take a little longer than we had anticipated. However, when we brought things to Corinne's attention she did her best to fix any issues. Everyone loves the fireplace. I would recommend Fireplace Element. Gerard is a true artist. He quickly understood our love for modern, simple lines and recommended designs that fit really nicely with the rest of the house's designs. He built a very large aluminum frame for the gas powered fireplace that created a beautiful, remarkable addition to our formal living room. 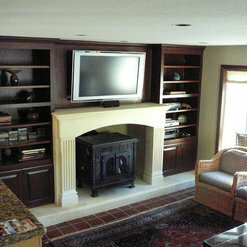 The work took longer than expected as Gerard wouldn't settle for anything but the highest quality and smoothest finish.